This palace was the residence of the sultana Aixa, mother of Boabdil. It is structured around a central courtyard. In one of its sides we can see a lookout tower. It preserves beautiful plasterwork on the upper floor with inscriptions from the Nasrid period. After the conquest, Queen Isabel la Católica ceded this palace to the monastery of Santa Isabel la Real, and it will not be until the beginning of the 20th century that it passes to the state and is restored. Declared an historic artistic monument in 1922. This building was a Alhóndiga, founded by Muhammad V. Place of shelter and store of merchants and traders arrived from distant places. After the conquest it was inn, store of carboneros and corral of comedies. Declared National Monument in the nineteenth century. In 1933 it passed to the state, being restored and incorporating to the patrimony of the city. The most impressive feature of this building is its magnificent horseshoe arch entrance that leads to the zaguán (foyer) and the fountain in the centre of the courtyard. The Bañuelo or Baño del Nogal, was declared National Monument in 1918. It is composed of three rooms, preceded by a house with a small courtyard. The cold, warm and hot rooms were built with reused Roman , Visigoths and Caliphs elements. The first room to enter would be the cold room or bayt al-barid; the next room, the hot or bayt al-wastani, is the most spacious of them all. Although this bath has been considered as a construction of the eleventh century, because of its typology that is very similar to those of the Nasrid period, it can be considered of a much more advanced period. The Horno de Oro house, built at the end of the XV century, and transformed after the castillian conquest, was a palatine residence. A rectangular courtyard with a reservoir centers the building, establishing the rooms on the shorter sides. The typical nasrid arcades of the courtyard argue an arcaded gallery. (*) MINORS MUST HAVE THEIR CORRESPONDING TICKETS TO ACCESS THE SPACES. If you are going to make your visit with children under 12 years of age, you should know that they need their corresponding free child ticket, which CANNOT BE PROVIDED at the ticket office, except for babies under 2 years of age. As established in Art. 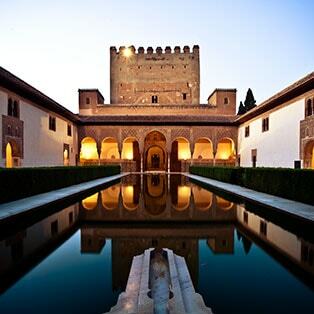 2.3 “Cases out of capacity control” of the Resolution of September 26th, 2016, of the Board of the Alhambra and Generalife, about the rules of visit, commercialization and other public uses of the Monumental Complex of the Alhambra and Generalife and their assigned assets. This channel is for private tourism and therefore is directed exclusively for the sale of tickets to individuals, in accordance with section 4.3 B) of the Resolution of September 26th, 2016, of the Board of the Alhambra and Generalife, for which the rules of visit, commercialization and other public uses of the Monumental Complex of the Alhambra and the Generalife and its attached assets are. The Board of the Alhambra and Generalife reserves the right to VOID those tickets that have been acquired for a purpose other than the channel for which they are intended. To visit the Andalusi Monuments, it is also recommended to realize the booking and the ticket purchase in advance and preferably online using the system of management and sales of tickets of the Council of the Alhambra and Generalife. Other options are the purchase by phone and TVRs, as long as there is availability. Tickets can be purchased through “print at home”, at the ticket offices of the Collection of Historic Buildings, on TVRs of the Alhambra or in the monuments themselves (Corral del Carbón, Bañuelo or Palace of Dar al-Horra). That all visitors must carry their ticket, printed on A4 paper, obverse and reverse. Print must be of good quality. Partially printed, stained, damaged or illegible tickets will not be accepted. To check the good quality of the print, make sure the information written on the ticket, as well as the QR code are legible. Each visitor independent of his age, must carry his own ticket, which may be issued individually and he is obliged to keep it until the exit of the monument visited, he must present it, with a personal identification document issued by the Ministry of the Interior or homologous organization of his country, at the request of any employee, either his own personnel or the security services, as well as the State Security Forces and Bodies, in this case. If the holder of the ticket is different from the person who is to carry out the visit, it must include the name and surname of the visitor in the “ticket” before printing. IN THE EVENT OF NOT OBSERVING SOME OF THE RULES SPECIFIED ABOVE THE TICKET WILL BE CONSIDERED NULL. This ticket is valid for one day. The spaces can be visited only once. Children under 12 have free admission but it must be reserved at the time of purchase and managed with the rest of the adult tickets. 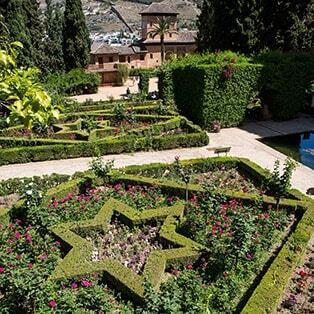 The Council of the Alhambra and Generalife will limit to ten the number of tickets that a private individual can acquire in a month, in order to make a better distribution of unorganized individual tourism tickets. Andalusi Monuments can be visited with the same tickets and with a single price. Sundays the tickets is free for all the Andalusi Monuments. 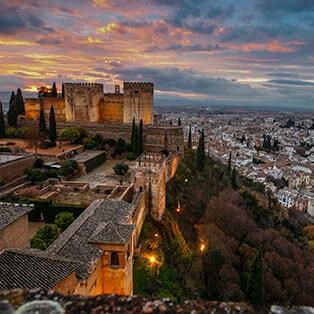 Access to the Palace of Carlos V, the Museum of the Alhambra and the Bath of the Mosque, is free. All the temporary exhibitions, that the Council of the Alhambra and the Generalife organize inside the monumental enclosure, are free. Mondays to Sundays: 9.00 h. until 14.30 h. and 17.00 h. until 20.30 h.
Corral del Carbón, every day from 9.00 h. until 20.00 h.